Start your Windows 10/8/7 or Server 2019/2016/2012/2008 program at boot and keep it running 24x7. Achieve 100% uptime today! 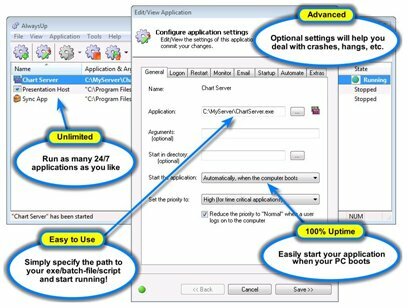 When run as a Windows Service, your application	can start automatically without someone having to log on, survive user logons/logoffs, and run entirely without user intervention. No programming is required. Take advantage of our risk-free 30-day trial and find out for yourself! 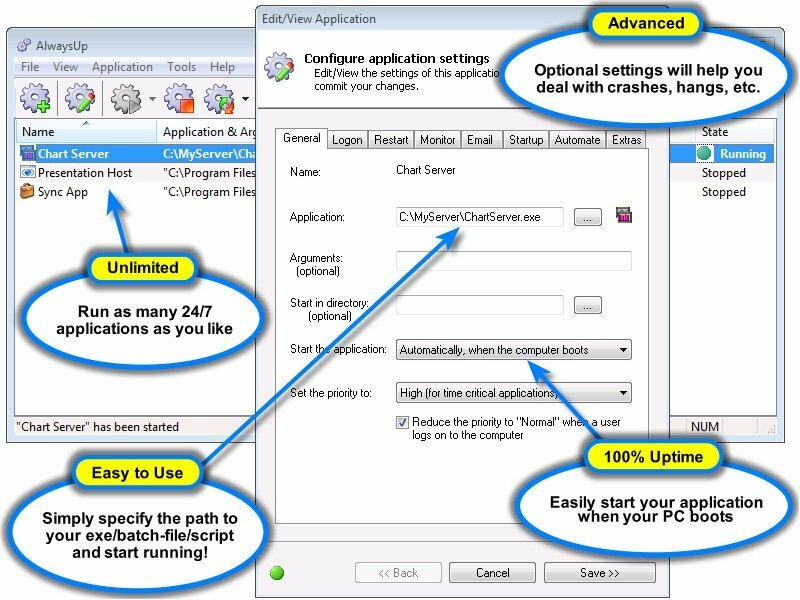 AlwaysUp's intuitive GUI makes it very easy to configure any application as a Windows Service. Just specify two key items (a name and the path to your application) and you are on your way! Come back for the advanced features later. Very easy to use — install your application as a Windows Service in just a few seconds! But perhaps most important of all, AlwaysUp was designed and implemented by Senior Software Engineers with over 20 years of real-world experience developing robust, mission-critical applications. Our software is of the highest quality, and we stand by it without reservation. Extend / customize AlwaysUp with your own failure detection plugins! 100% Satisfaction / Money Back Guarantee! Click here to purchase AlwaysUp now!